Our customer has supplied granite products for over 80 years, producing 650,000 tonnes per annum, with a further 30 years of reserves planned for the site. They have won awards for quarry rehabilitation and openly share an environmental and educational focus within the local community. To transport the conveyed granite rock for screening, our customer uses a chute system constructed out of steel, with 16mm thick bisalloy plate as the chute liner. Due the weight of the rock and the drop height 2.5 metres, the chute experienced significant abrasion damage with the bisalloy plates offering a wear life of only 5 days before it routinely had to be replaced with further bisalloy “quick fix” plating patches. This resulted in unsatisfactory labour costs, as well as lost production time due to frequent plant shutdowns for the repair work to be completed safely. 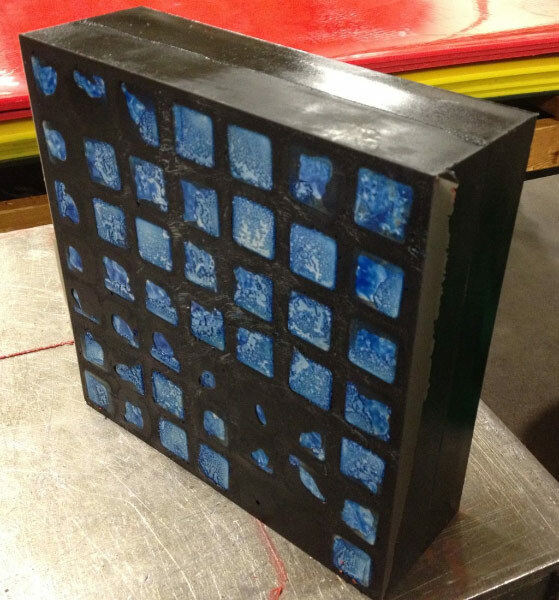 This led our customer to search for a better impact wear liner solution. To resolve this problem, our customer favoured the features of K-Redi-Liner because it was lightweight in comparison to the Bisalloy patches and also only needed to be bolted into place and not welded. Overall it required less labour to install which was meant that replacement costs were reduced. However, the 16 mm solid polyurethane panel lasted on 3 days before it needed replacing. To address this specific angle chute, the 400 mm rock size and the drop height from the conveyor to the chute prior to screening, Kinder Australia recommended trialing the newest edition to the K-Redi-Liner range, incorporating ceramic cubes with dual durometer suspension formulas. The wear life of the K-Redi-Liner KP Dual Duro was significant, lasting 14 months before a replacement panel was required. The end result was a significant reduction in replacement liner costs, as well as a significant reduction in costs associated with installation labour. Our customer was delighted in the performance of the K-Redi-Liner KP Dual Duro.